The PulseTech® 24VPSC-25W Solar Pulse Charger (25.0 Watt, 833mA) will charge and desulfate all 24-volt battery systems ensuring maximum battery performance. It works with any lead-acid batteries (VRLA, AGM, flooded cell and gel) and prevents dead batteries by keeping them in like-new condition all the time, no matter how long stored vehicles or equipment sit unused outside. The solar charger utilizes PulseTech's patented Pulse Technology, which increases the battery's ability to maintain charge and accept re-charge, dramatically extending battery life. It is safe, reliable, weatherproof, and helps protect the environment. 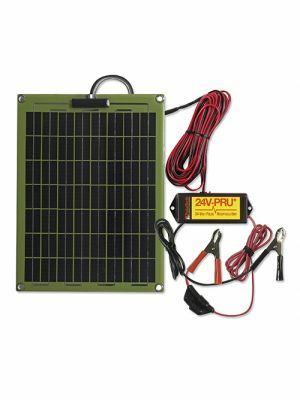 The 24VPSC-25W solar panel (14.4" x 17.9" x 0.125") comes with a circuit box, 50" leads from the box to clamps and 25' wire from the solar panel to the box. 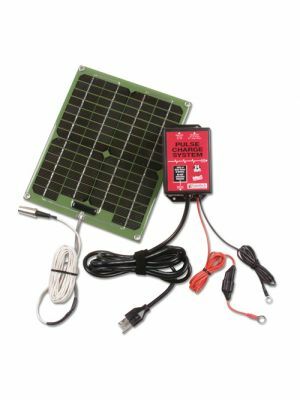 Rated at 833mA this 25-Watt Pulse Solar Charger provides high frequency optimized pulsing across two, four or six batteries wired in series parallel. Our exclusive and patented Pulse Technology works to minimize and reduce naturally occurring battery sulfation - the main cause of battery failures. By reducing the size and number of lead sulfate deposits on the battery plates that negatively affect the battery's ability to accept, store and release energy, the battery charges deeper, maintains greater reserve capacity and lasts longer. All of PulseTech's solar panels have higher efficiency, higher quality crystalline silicon cells that pack more power per square inch and have a longer life than standard amorphous ''thin film'' solar cells. That means you can get the power you need in a sturdier, smaller-sized solar panel with more installation options. Instead of a breakable glass, this solar panel is protected with a clear, polyurethane plastic coating mounted on a laminated aluminum substrate to make them virtually indestructible and impervious to weather, aging and damage from bumps and knocks. Solar Panel Dimensions: 14.4" x 17.9" x 0.125"
Solar Panel Mounting Dimensions: 17.3" x 13.8"
PRU Enclosure Dimensions: 4.9" x 1.8" x 1"